The Gray Iron Fitness Newsletter, Issue #147 A great fitness tool. Or as Jack LaLanne used to say, “Your waistline is your lifeline.” Additionally, an honest look in the mirror at your naked body is another low-tech but reliable indicator of how well you’ve been treating yourself . . . and, it seems, a predictor of your future health. Multiply the results of your waist measurement by two. If the number is greater than your height, you are four times more likely to get heart disease. It’s more predictive than cholesterol tests, he says. And the medical profession seems to agree. 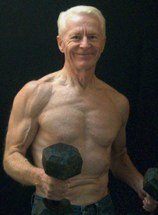 At least ninety-something percent of the Gray Iron Fitness Newsletter and my website is dedicated to strength, physical fitness and health. But today, I’m asking that you look at another highly important facet of your life. Please read on. But also keep in mind that unforeseen events and circumstances may require leaving your work, no matter how much you might prefer to continue. Or, over the years a change in your attitude and priorities may evolve. No one can be 100 percent certain how these things will play out. Just knowing that you have the option to do as you wish is a wonderful thing. A couple of factors are imperative if you want to enjoy such options: 1) You must have good physical and emotional health; and 2) your financial condition must be sound. If you squander either, the second half of life will not be pleasant. That is almost guaranteed. The sooner we understand these facts and act on them, the better off we will be. Yet even for those who act late in life, some measure of improvement is still possible — at any age. I promise you will not be disappointed in what you find. And if it stirs you to act on something you may have been putting off, you will be delighted that you took action.